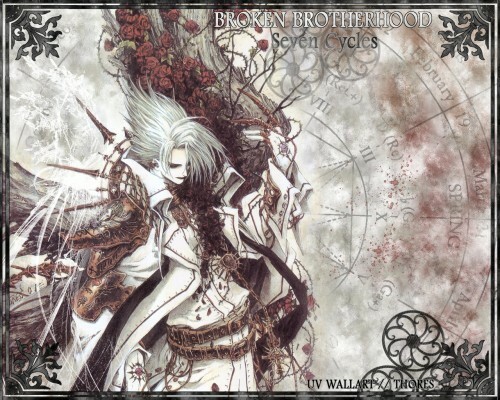 In 2005 the UV's Broken Brotherhood series of artworks was created as an exclusive commemorative collection in appreciation of the as then, still underground novel, manga and anime series by written by Sauno Yoshida, designed by Thores Shibamoto, produced by Gonzo Studios and published TokyoPOP. In the advent of 2007 the Broken Brotherhood series of artworks have taken on a new revelation within Seven Cycles. While the original Broken Brotherhood. series was never completed and featured an array of primary artwork by Yukiko, Kiyo Kyujo, Atsuko Nakajima and Thores Shibamoto, the collection was terminated after seven pieces. Seven Cycles. is a collective composition in tribute to the original series. The all new Seven Cycles series features a total of ten completed artworks with primary character art exclusively hand selected and personally scanned from Thores Shibamoto's breath-taking art book entitled 'Fabrica Theologiae - Trinity Blood Illustrations'. The complete Seven Cycles series was exclusively released with special edition digitally encoded tags. While the entire series of ten artworks will not be published here at MiniTokyo, the first and final volumes most certainly will! Cain Nightlord, brother of Abel, he shares the name of the son punished for his siblings biblical murder of jealousy and misunderstanding. This self-enlightened angel bares owner of a psychological imbalance so profound his dais of artificially constructed divinity holds the entire world for ransom. My attraction to this Thores painting rests not only on the polar opposite of the character's construction (which could only be understood after having read Yoshida's original work) but also classical European intricacy and feverish attention to detail that again only the brilliant Thores can bring to light in such exuberance. While incorporating a white base - acrylic texture and symbolic elements are repeated in lavish richness whose detail once again can only be truly appreciated by viewing the work in its complete scale. Secondarily to this, the elegant frame motif is the only one within the series designed in tarnished silver marking the Seven Cycles series' end. Anyways, I really liked the wallpaper. It's amazing how you manage to put things in a way that they complete each other in a very balanced way. The wall is perfect. I loved the frame you designed and also the background you created. Also the colors were very well selected. Congratulations! Another perfect job from you! You are right when you write: wallart! It's definitly art what you are doing. This has very nice color balance, and I can see what you were going for in the bg. The edges of things in the bg are a little too smoothe and sharp compared to the painty style of the image. Also, the text is really distracting because it's so big and so bold. this is beautiful. I love the border, colors and the symbol thing. I love everything about this. Its hard to use Trinity Blood's artwork and do it justice, but you pulled it off..
this is the better of the 2 most recent submissions- the grungy bg fits well with Cain Nightrod. my only crit here is the text up top- jettison that. although personally [my own taste] i would have omitted the border- it works well here. so cool man! i luv t! great background, great art, i <3 it! thank you so much for putting this up!